WASHINGTON – Today is the 152nd birthday of the U.S. Government Printing Office (GPO). 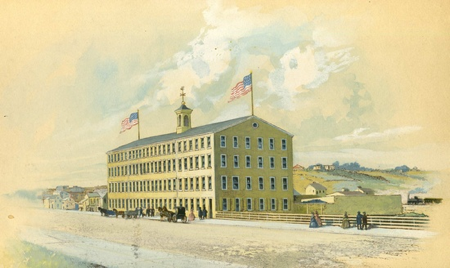 The agency first opened its doors for business on March 4, 1861, the same day Abraham Lincoln was inaugurated as the 16th President, with a mission based on the requirement in Article I, section 5 of the Constitution that "each House shall keep a journal of its proceedings and from time to time publish the same." Since Lincoln’s time GPO has produced the official version of every great American state paper and an uncounted number of other Government publications, forms, and documents, including the Emancipation Proclamation, Social Security cards, Medicare and Medicaid information, census forms, tax forms, citizenship forms, military histories ranging from the Official Records of the War of the Rebellion to the latest accounts of our forces in Afghanistan, emergency documents like the ration cards and the "Buy Bonds" posters used during World War II, the Warren Commission Report on President Kennedy’s assassination, the Watergate transcripts, the 9/11 Commission Report, Presidential inaugural addresses, Supreme Court opinions, and the great acts of Congress that have shaped American society. Congress purchased this printing office from one of the last of the government contractor printers, Cornelius Wendell, in 1860. It faced H St. NW at the corner of North Capitol St. NW. Once produced solely as ink-on-paper, GPO’s products and processes today are the result of more than generation of experience with digital information technologies: computerized composition, digital presses, online dissemination, passports and smart cards featuring computer chips, and mobile apps, with social media accounts on Facebook, YouTube, Twitter, and Pinterest. GPO today is the OFFICIAL, DIGITAL, SECURE resource for the official information products of the Federal Government. The agency's mission was recently reviewed and validated in an independent report of the National Academy of Public Administration, which found that "GPO's core mission of authenticating, preserving, and distributing Federal information remains critically important to American democracy" in the digital age. "Today marks 152 years of GPO Keeping America Informed. Throughout our history GPO has evolved and adapted to new technologies that have enabled us to meet the information needs of Congress, Federal agencies, and the public," said Acting Public Printer Davita Vance-Cooks. "I am proud of GPO’s accomplishments and of our position today serving as the OFFICIAL, DIGITAL, SECURE provider of information products and services for the Federal Government." GPO is the Federal Government’s official, digital, secure resource for producing, procuring, cataloging, indexing, authenticating, disseminating, and preserving the official information products of the U.S. Government. The GPO is responsible for the production and distribution of information products and services for all three branches of the Federal Government, including U.S. passports for the Department of State as well as the official publications of Congress, the White House, and other Federal agencies in digital and print formats. GPO provides for permanent public access to Federal Government information at no charge through our Federal Digital System (www.fdsys.gov), partnerships with approximately 1,200 libraries nationwide participating in the Federal Depository Library Program, and our secure online bookstore. For more information, please visit www.gpo.gov.